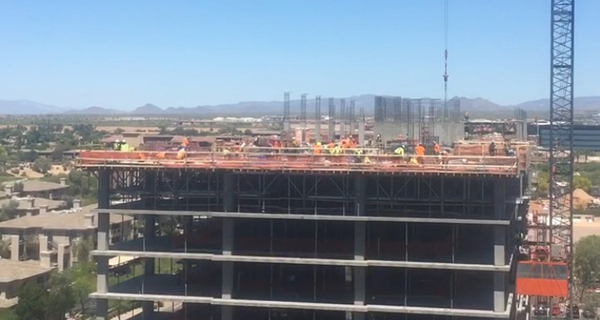 PHOENIX, Arizona – The last concrete beam has been placed atop 7120 Optima Kierland, signaling the culmination of this phase of construction and the beginning of a new era of luxury, high-rise condominium living in North Scottsdale. Optima Kierland’s structure is now complete with more than 60 percent of the homes in the first condominium tower now sold. Move-ins for the first residents are scheduled for early 2018; completion of all residences is set for August 2018.